Last night I watched one of my favourite programmes “Who Do You Think You Are?” whose subject was Irish actress Dervla Kirwan. I love this programme at the best of times and have vowed if I ever come into serious money I will engage the services of ‘professionals’ to uncover Who I Am! I know a little about Who I Am and my story is not that unusual in Ireland. My family tree really contains elements of the contradictions, passions and tragedy of relatively recent Irish history. My father’s family were typically peasant farmers from Laois in the Irish midlands. In order to carve some kind of future for himself my paternal grandfather signed up with the British Army to fight in the First World War. He saw service in France and later in India and his stories were of no interest to me at all, when he used to relive his days as a Cavalry man over ‘tea’ in our house. How I wish I could have just one of those mealtimes back now! My mother’s parents both came from North Cork, from the town of Fermoy. My grandmother by all accounts came from middle class family of teachers. She grew up in the grounds of Colman’s College in Fermoy where her father taught. She had a university education (very unusual) and qualified as a teacher of Mathematics and English. Her husband, my grandfather was probably the most colourful of all my grandparents. His name was George Power and from some old photographs I have, it is clear that he was a handsome man who stood over 6 feet tall. He joined the IRA as a very young man. His father (my great grandfather) was a tailor and also a noted Republican in Fermoy. His mother however (my great grandmother), Elizabeth Vernon was British (born in India) and most likely the daughter of a British Army officer who would have been stationed in the town. During the War of Independence, Cork was a hotbed of IRA activity where Michael Collins developed his guerrilla tactics which were eventually successful in gaining Irish freedom. My grandfather was in command of 3 battalions, Fermoy, Castletownroche and Mitchelstown and as such must have been a bit of a hero in the locality. He worked with Michael Collins and also with local leader Liam Lynch and as such was as the forefront of activities during the War of Independence. There are family legends about him being involved in the capture a British General and also of how he himself was captured by the British, only to escape again through a toilet window. The War of Independence was one of the bloodiest periods of Irish history with atrocities being carried out by both sides. It is important to note that the IRA I refer to at this time had a mandate from the Irish people to fight for freedom from Britain who had been ruling our country for hundreds of years. I have no wish to in any way romanticise this period of history but I do feel that in the interests of political correctness, we are reluctant to say that these brave men, who fought the (then) mightiest nation in the world and won, were heroes. I cried as I watched Dervla Kirwan last night, being taken to places in Cork where her grandfather was involved in fighting. These men, farmers, shop keepers and tailors (like my grandfather) were brave and heroic beyond comprehension. So too were the families and communities who supported them. Thanks to them, I live in an independent peaceful Ireland. We owe them a huge debt of gratitude. Note: following the War of Independence and the signing of the Treaty, Ireland entered one of the most tragic periods of her history. Those who had fought against all the odds to have the British withdraw from the country, were deeply divided on the terms of the Treaty which Collins and others had negotiated with the British Government. Many felt that Collins had sold out as what was obtained was not full freedom. However Collins felt it was the best that could be achieved at the time and he believed that it would lead eventually to full freedom. Following the truce and signing of the Treaty, Ireland tore itself apart during a violent Civil War which divided communities and families. It sullied the success of the War of Independence and left a nightmare so dark that those involved in both conflicts often never talked them. My grandfather left the country and went to England, only returning shortly after the outbreak of World War 2. 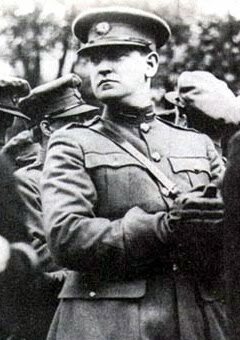 PHOTO OF GENERAL MICHAEL COLLINS, who was killed by Anti Treaty forces in his native Cork on the 22nd of August 1922. Civil War, http://schemas.google.com/blogger/2008/kind#post, IRA, Irish war of Independence, North Cork, Who Do You Think You Are? It was nice to hear about your family, giving us a glimpse of where you came from and who you are. It was also nice to hear about the IRA and some Irish history from a personal point of view. So like my family backround from Cork, great story and yes they were heroes. Don't you just wish you'd asked more questions of the older generation when you had the chance? I so wish I'd asked more about what my parents and grandparents did during WW1 and 2. Barbara, I'm so glad I came into your blog tonight to read this. I am fascinated by Ireland, and I love family history. I have many, many stories of my ancestors, and am so glad I got a book put together of my mother's and father's lives before they were too old to remember their past! But it was a past that I had shared somewhat too. This is a very beautifully written account. Do you have other ancestral stories? If so, are you getting them down? p.s. I have always loved the photo at the top of your blog! My maternal grandfather was a Kerry man from Tralee who participated in Banna Strand and a staunch Collins man. My paternal grandfather was a Dev supporter from Co. Waterford. Made for interesting conversations around the table at our family dinners! I too wish I had paid more attention to the stories. I think you are so right Barbara. We let the opportunities to find out about the lives of our grandparents pass us by. When we finally realise that we want to get the stories – it's too late and another slice of family history has been lost. I enjoyed reading your blog and like you, would love to find out more. Interesting and intriguing! I have been using the Census Records of 1901 and 1911 now online to check my own background – a lot less illustrious than yours but surprising all the same. I suppose you'll have to write the book now…. Hi Theresa – glad u enjoyed it! Hi Yvonne J – yep I am sure that is a great that almost everyone has. Not asking more questions of our parents/grandparents till its too late. Hi Ann – you are so right to have written down your family stories. My mother has started to write some stuff down but of course that is only one side of my family. Since my father died, I really dont have much connection with the other side! Pity. Altho through Facebook I am now in contact with one of my first cousins which is good. Ann – yep your family is typical of the divide in Ireland which is only now beginning to die out. Hey Padraic – howareya? yeah its on my evergrowing to do list!!! Great story! Love the part about the escape through the toilet window! I run a website called Family Legends (www.familylegends.ca). Please consider submitting your family myths there to share them with a wider audience. I am just back from two lovely weeks in Kerry and as we were busy and had a telly the size of a toaster, we didnt watch much t.v. However, the Dervla Kirwin progrmamme was the only one we watched and I loved it. Great story and what a grandfather to be proud of, all those stories are well worth writing down. We visited Daniel O'Connell's estate in Kerry and his too was a fascinating tale. The men and the boys of our grandfathers generation appeared to be much different species to the current generations. We should be eternally grateful to the dedication and bravery they showed for acquiring our republic. Hi Sarah.. thanks for the comment. Will pay a visit to your site. Sounds like a great idea.